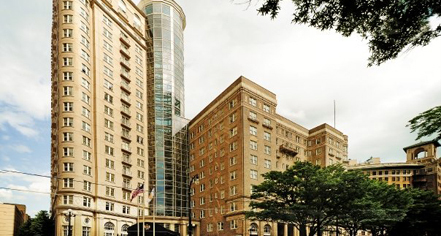 An icon in midtown Atlanta, Georgia, nestled on the historic Peachtree Street across the street from the fabulous Fox Theatre, the Georgian Terrace is a luxury hotel affording exquisite accommodations and excellent service. Located in the heart of the business and cultural neighborhood, the Georgian Terrace welcomes guests with a true comforting experience offering fine dining, meeting and event space, and close proximity to Atlanta's most exciting attractions. Classical fixtures, such as Palladian-styled windows, terra cotta decorations, and stately chandeliers are featured throughout this Beaux-Arts property. 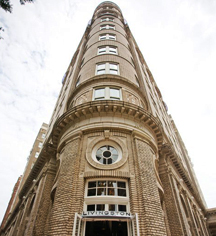 Since its grand opening on October 2, 1911, the Georgian Terrace has been graced by movie stars and dignitaries alike, including Clark Gable, Calvin Coolidge, and F. Scott Fitzgerald. The Georgian Terrace was listed on the National Register of Historic Places in 1986. From opening day, the Georgian Terrace has been recognized for its superior lodging, attentive staff, and premium comfort. Georgian Terrace, a member of Historic Hotels Worldwide since 2012, dates back to 1911. The stars and the director of the movie Gone With the Wind, with the exception of Vivien Leigh and her lover at the time, Laurence Olivier, stayed at the hotel in 1939. Cancellation Policy: 24 hours (by 6:00 p.m.) the day before arrival. Deposit: Plenthouse suites require a $300 refundable deposit. Hotel/Resort Fees & Taxes: Taxes: 8% state, 8% local, and $5/nt hotel tax. Occupancy Restrictions: Varies by room type. The largest unit available on-property can accommodate six (6) people not including penthouse options. Parking: Self-parking: Available; $25 overnight. Valet parking: Available; $30 overnight. Pet Policy: Service animals allowed: Yes. Pets allowed: Yes. Maximum size: 25lbs. Fee: $75 per pet cleaning. Not limited to dogs and cats. Restrictions: Must have copy of vaccinations at check-in. Shuttle Service: Area shuttle: Available. Learn more about the History of The Georgian Terrace .